I love this book. The author has a strong sense of African and world history. He pays tribute to some fantastic (scientific) discoverers and inventors. Tragically these days (especially among the young), scientific marvels are taken for granted; electricity generally, radio, tv, fans, telephone, internet, mobile phones. Yet all these things are very very new in world history. In fact, for most centuries, the world and its people existed without all these wonders. Yes, even in the western world the discovery of electricity occurred only after thousands of years since mankind had been living on earth! This is a very sobering thought, and the author (chief Bolaji) here is very perceptive and appreciative of this fact. Nowadays we whine and whinge about minuscule glitches on internet, prized smartphones etc – never sparing a thought for the great, selfless minds that laid the foundation for all of this. 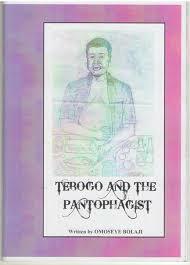 In this wise, this work -Tebogo and the pantophagist is a superb work that I personally would love to see being read in schools all over Africa.